This is a popular street food in Malaysia and Indonesia. Satay means marinated meat threaded onto skewers and served with a sauce – spicy peanut in this case. Satay is available from streetside vendors to the top restaurants throughout Malaysia. Beef, pork, prawns and tofu work just as well as chicken. Omit the chilli for a cooler alternative. 1. Mix the oil, soy, 1 clove garlic, 1 tsp cumin, turmeric, chilli paste, lemongrass paste and 1 tbsp peanut butter together in a bowl. Cut the chicken into long thin strips and a stir into the marinade to evenly coat. Marinate for 1 hour. 2. Meanwhile, soak 12 wooden satay skewers in water. 3. Thread the chicken onto the skewers, and place on a foil-lined grill pan under a preheated grill for 10 minutes, turning once, until the chicken is cooked throughout with no pink meat. 4. Meanwhile, place the remaining peanut butter in a small pan with the rest of the cumin and garlic, 150ml water, kicap manis and half the salad onions. Bring to the boil, and stir in the lime juice. 5. 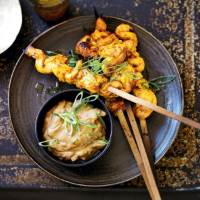 Serve the satay sauce with the chicken skewers, and scatter over the remaining salad onions.